Pictured above, one of the happiest days of my life. 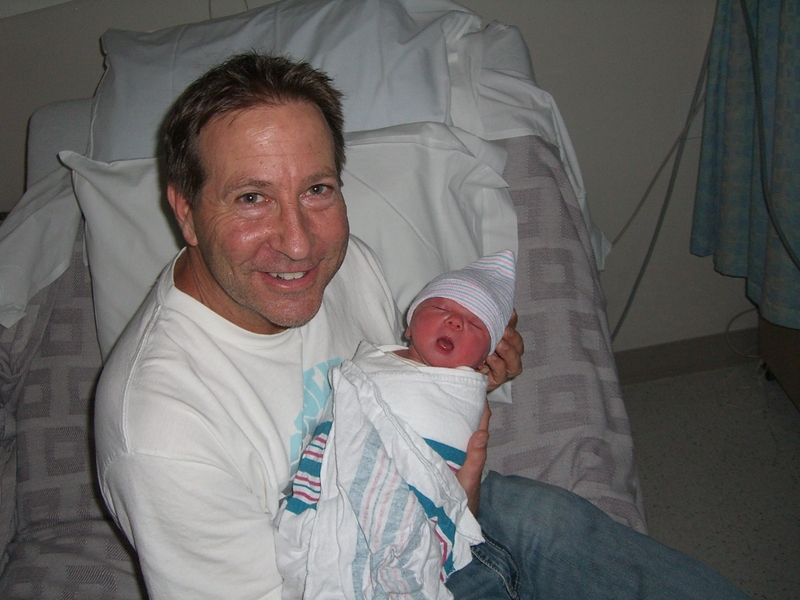 November 11, 2009…the birth of my baby girl. I am 45 years old, yes getting a late start on kids, but that’s just my life. I have been married to my beautiful wife for almost 17 years. There are many sides to me. I am a very creative person, I am a song writer/singer and have been doing that since I was 12 years old. Never professionally, just as a hobby, or more like therapy. I did have a Bluegrass period in my life where I played 5-string banjo in a bluegrass band in Texas in my early 20′s…what a blast! I am a business man, I have a good business supplying products to the landscape industry in Los Angeles. I have been working on that for the past 15 years and I have done pretty well. Not independently wealthy by any means, I have to get up at 6AM and go to work everyday like everyone else. So this TV endeavour is a weekend thing right now, not so easy with my 9 week old baby at home. I am a dreamer! I feel like the only limitations that anyone has are the ones we attach to ourselves. In my mind, anything is possible. I love to travel, I have been all over the world. Istanbul, Paris, Munich, Figi, Venice, Mexico, are just a few of the places in the world where I have been. One of the best trips I ever went on was Jamaica. No, not one of those “All Inclusive” resorts…I went with a friend of mine who is a native and grew up there. We rented a car and drove for a week, each night staying with a cousin, an Aunt, or a friend. On the first day we headed straight to a little shack on the beach where we selected our live fish from a bucket, and sat patiently drinking a beer while our fish was being prepared. This was a great adventure and we ate nothing but street food the entire trip. It is my intention to repeat this trip with my buddy Duane, only this time we bring the film crew and get it all for episode 2. I love to cook, I get that from my mother. I love to eat exotic foods from all cultures. There is an instant bond that is created from eating food from a culture that is not your own. That is why I love street food. You walk up to some strange little spot in a foreign country where all the locals are enjoying their favorite food, you obviously stick out like a sore thumb. When the people see that you are not afraid to try the food, or better yet you are actually enjoying the food, you are welcomed as a local. There is no feeling in the world like it. So this is me- I am dreaming again. Even if I never get this show off the ground, I refuse to stop dreaming!